This is such a great idea! It’s great to have some sketch motivation until my next Sketchbook Skool Klass start. Each day of the #ajchallenge has a different subject for drawing. I started late on this–on day 2, but will do my best to keep up with it. This drawing is for Day 3–something industrial. I don’t think my choice of subject fits exactly, as industrial seems to bring to mind the tools needed to fabricate a product. But, it feels industrial to me as this boat propeller is made out of metals and had to be forged in an industrial way! What is really funny about this is, it was drawn on 1/3/15 and I put in the date as 2014! Change it hard. Next challenge is to draw an animal. Looking forward to that one. 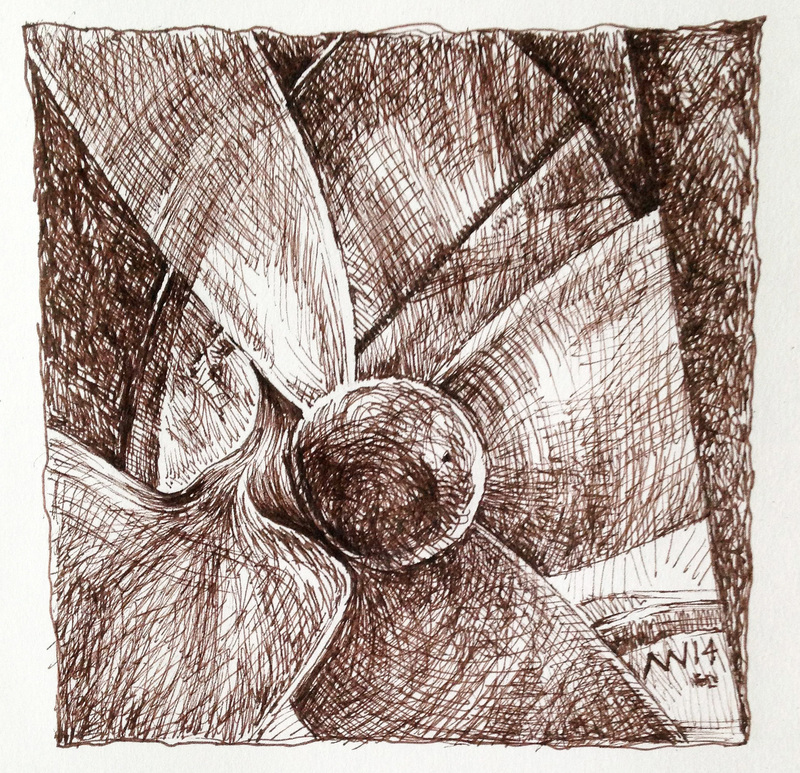 This entry was posted in Uncategorized and tagged #ajchallenge, Artist's Journal Challenge, boat propeller, ink drawing, sepia ink, sketch. Bookmark the permalink. Hi AM, so glad you are doing another class. Wish Dad would, but he doesn’t think he needs a class. And of course he’s too busy making radios work and building antennas. I tried the link to AJChallenge and it didn’t work. good to know about the link. It might only work for those in the fb group. I put it in there so I could get back to it. I think there is another one though that might be public. I don’t know that I “need” a class either…but it sure is fun!